Also starring: Gary Cooper as the solemn, upright and self-doubting Arjuna, Margaret Dumont as an exasperated Balarama, Chico Marx as a very shrill Draupadi and Harpo as a silently adoring Radha (to whom Krishna says, "I could dance with you till the cows come home. On second thought I'd rather dance with the cows until you come home"). Here is my contribution - Errol Flynn as Arjuna. Obvious choice, but katherine hepburn as kunti or gandhari. 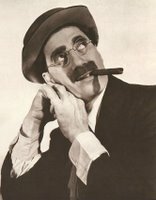 Aalokika: I like that image, but it probably wouldn’t work with Groucho playing Krishna - too much exuberance on one chariot. Better to have a ponderous, introspective Arjuna, making him the perfect foil for Groucho’s jokes. Anangbhai: Hepburn as Gandhari might be interesting. But not Kunti. Too weepy. Kate would probably have twisted Karna's ears and dragged him to the Pandava camp. Nope - Gandhari has to be Bette Davis. For the moment, all I can think of is Red Skelton as Duryodhana. Rudolph Valentino as Yudhishtira, and Jerry Lewis-Dean Martin as Nakula-Sahadeva (mix and match, no hassles). This parody of Hindu culture and tradition is totally reprehensible and shocking coming from a responsible blogger like you. And why don't you try and make fun of some Islamic personalities for a change, you pseudo-secularist? Huh? I thought this was a parody of Hollywood's Jews. And don't call me a responsible blogger, you pseudo-fascist! Shamya: Lewis-Martin and Skelton aren't from the 1930s. Also, ideally the other characters need to be played straight - they must take the whole thing very seriously, even while Groucho insults them. 4. I don't like Chico as Draupadi. I think actually Chico as Vidur would be funnier (picture Dhritrashtra - Welles - asking him for advice). Also, I think the part of Draupadi should go to Vivian Leigh. All that practise being Scarlett has got to help. 8. Fred Astaire as Nakul and Sahadev (it's not like anyone can tell them apart). While the war is being fought they can be off in a corner, dancing. Oh, and how could I forget - Jimmy Stewart as Yudhishtir. Pity Heston wasn't around till the 40s. He would have made such a good Bheem. damn! i was going to say, peter lorre as shakuni! bette davis as gandhari is inspired, shamya. Sydney Greenstreet as Ashwatthama the elephant. Falstaff: Chico Marx as the Mahabharata's most austere, most goody-two-shoes character? A faux-Italian-accented, fast-talking Vidura? Lovely! Thanks also for that image you've put in my head of Olivier and Groucho in a thespians' battle. Fantasy is so much more meaningful than real life, it turns out. I think Henry Fonda would make a better Yudhisthira than Jimmy Stewart. Space Bar: Since Ashwatthama the elephant has a very marginal role, maybe Greenstreet could be Bhagadatta's great beast Supratika, who sits on Bheema at one point during the war. Mae West as Amba - excellent! Can picture her smacking Olivier's Bheeshma around some. Jai: Sure. The scene that's really going to kill me is the one where Vidura plays the piano. Agree with you on Fonda, but I want Stewart in there. Wasn't there one dissenting brother among the Kauravas (I might be making this up)? Maybe Stewart could be him? I'm still mulling over Kunti. If only Lauren Bacall had been older in the 30s - I have this mental image of the Kunti-Karna scene as played between her and Bogart. Seriously Oedipal stuff. "You do know how to shoot an arrow don't you? You just pull your bowstring taut, and let go." Maybe Dietrich? 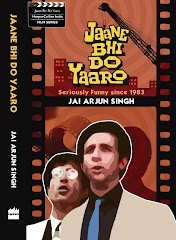 "I haff only fife sons und dat is how it shall ztay"
Off topic, but have you heard about the new Ramayan comic book? Produced by a western company called Virgin Comics, sets Ramayan in a post-apocalyptic world (Comic titled Ramyan 3392 AD). Here's there website if you're interested. re jimmy steewart: i have this image of him, earnest and strong as hanuman on arjuna's flagstaff. why have you switched to blogger beta? If this were a silent movie, I would have suggested Chaplin for Krishna (not that he can't play it in a talkie). + Peter Lorre as an effeminate Shakuni is an inspired choice - kudos to whoever came up w/ that! Falstaff: Jimmy Stewart as Vikarna, the sole Voice of Reason during the game of dice? Excellent. And then Bogie gets up, cigar in hand, waves condescendingly at him to sit down, and orders the disrobing to begin. Pankaj: there are plenty of alternate takes on the Mahabharata - notably Pratibha Ray's Yajnaseni as well as other versions centred on Bheema, Karna, Duryodhana, Ashwatthama, and astonishingly even one on Sahadeva! Space Bar: you mean why haven't I switched to Beta? Will soon. I hope it won't screw up the links that I've manually put on the sidebar? - the old posts. Vi: yes, I know about that. Virgin is doing some interesting stuff now - the Devi series etc. Anon: strangely enough, I think Laurel and Hardy as Nakula and Sahadeva would work better if you just had cardboard cutouts of them (especially in scenes where the five brothers are standing together) - no fooling around, no funny antics, just standing there frozen in time. Laughton as Bheeshma, interesting. But what would one do for the younger Bheeshma then? Since it's a well-documented fact that Charles Laughton was never young. jai, no: every time i want to post acomment, i'm asked for my bogger id/google account etc. far as i now, this only happens on the beta blogs' comments section. that's why i asked. never used ot happen before; there was just the word verification. I read a few posts you wrote on Ramesh Menon's Mahabharatha - i was impressed. But i didn't like this cheap potshot of an article..If we have to bemoan european companies making footwear or toilet seat covers with Hindu Gods' pictures, we should also bemoan the kind of irreverence we ourselves show towards our culture, religion, Gods. Such attitude clearly starts at home. 1. If you were an Indian Christian or a Muslim, and someone strongly objected to your article's wrong take on religious sensibilities, you would have taken this article down. (instance of MF Hussain on "a tale of 3 cities (was that the movie name?) comes to mind). 2. But from you, such an objection would bring forth an articulate tirade on freedom of speech. the second point is a conjecture..but somehow i think that's the way it will be..
btw, would you mind deleting your post? You know what, Jai, Giri has a point. Groucho Marx was an exceptionally talented artist, not some blue-skinned skirt chaser with a yen for high cholestrol foods. I know you meant the post in jest, but I can see how it could be offensive to Marx Brothers worshippers. And look at all the other names we bandy about - Hepburn, Bogart, Cooper, Cagney, Stewart, Fonda - such irreverence to the gods is the reason we now live in a world where Leonardo DiCaprio is a star. Speak for yourself. I haven't done any of this bemoaning. "Our culture, religion, Gods"? What if I were to tell you now that you've insulted my atheist sentiments by including me in the God-worshippers? Giri: with ref. to your second comment, yes, that is quite a conjecture you've made there. I'm not much good at "tirading" about anything, articulately or otherwise. Giri: just a tip for your happiness, because I'm genuinely concerned about the angst in your comments. As Lord Krishna told Narada (and later Arjuna),the world and everything in it is maya. Nothing really exists. So why can't you adopt the same attitude towards evil bloggers blaspheming away on their sites? I don't really exist, you know. Neither does this post. Consider it already deleted. Falstaff: no irreverence towards Leo will be tolerated here. After The Departed, he is God. Please delete your comment. I hope you see the problem here. You are asking a non-Hindu, whether Jai is an atheist or a Sikh, he is still a non-Hindu, to respect your Gods. In fact, you should be glad that someone is so interested in Mahabharata. No? I concur. After The Departed, no snide comments about Leo should be tolerated. Confused: Just clarifying here that despite the many jokey things I've written about the Mahabharata in recent posts (many of which were self-evidently facetious), it's by far my favourite work of literature. But I'm interested in it as a great story about being human, not as a religious text preaching down to us. Aye. I totally understand. Its been rather educative to read your posts and get different perspectives on Mahabharata. Am a bit confused with the last few comments here...and am totally not equipped to comment on this. But want to make the point that I've never thought of the Mahabharata as anything particularly religious. The Ramayana, yes - but that's also become kind of religious now. Never realised it till 1992, blissfully ignorant as I was about all these North Indian things while in Calcutta. Jai: I wasn't focussing entirely on the 1930s of course...and when I think of Bheema, I can't think beyond Sohrab Modi. Peter Lorre as Shakuni is very, very exciting, as is Mae West as Amba. Wonderful! Just happened to got to this site somehow.. man you guys do live in a world of your own, where is it ? Seems to be on a different planet then my India. Anon: dang! Where is your India? Ours begins at 6°44' and 35°30' north latitude - do drop by sometime. Also, I think Jimmy Stewart with his unique persona that blended naive idealism with a neurotic tendency will make a great Arjuna. Interestingly, Cary Grant is one thirties star who is impossible to cast in Mahabharata.